Memorial Day Weekend now available due to cancellation! Newly renovated and updated Lake House. Located a mile away from the new Heritage Trail that runs all the way to the Sleeping Bear Dunes! Come and enjoy your next family vacation in Northern Michigan. 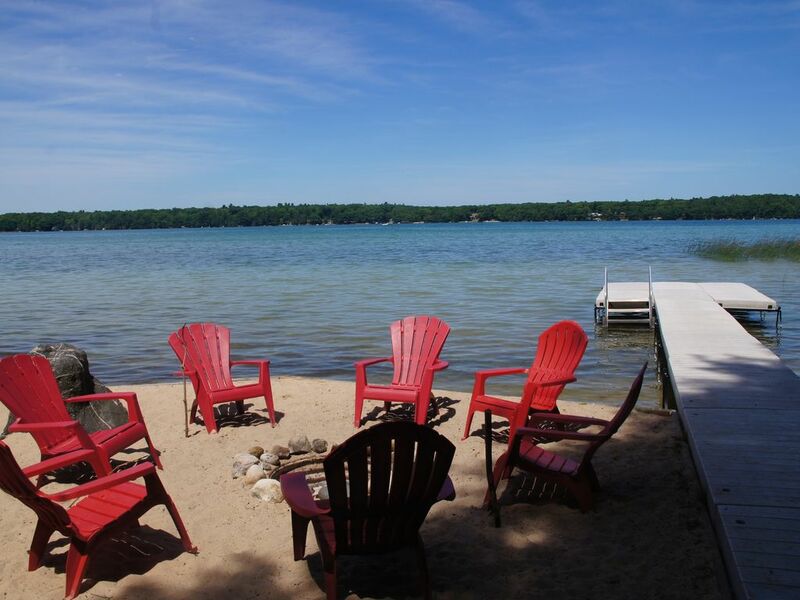 Our cottage is located on Little Traverse Lake in beautiful Leelanau County. The house is directly on the lake, with no road or obstruction between the house and the water. There is a large deck for outdoor eating and grilling and beautiful sunsets year round. The sandy area leads out to a dock over the warm, crystal clear lake. There are also 2 kayaks and plenty of life jackets of every size onsite for your use. The Lake House has 4 bedrooms and 2 bathrooms. The first bedroom has a king bed, the second has a queen, the third is a bunkroom with 2 bunks with full beds on the bottom and twins on top and the fourth bedroom has one bunk with full on the bottom and twin on top. Perfect for 2 families to share, or cozy enough for a couple to enjoy on their own. The entire front of the home is windows directly overlooking the beautiful sunsets over Little Traverse Lake. Inside, there is a large, knotty pine living room with a cathedral ceiling and a massive fieldstone fireplace, a fully-stocked kitchen with a gorgeous lake view, all within steps of the water. For those of you who prefer to do your cooking outdoors, there is a large deck built just outside the sliding glass doors, with a gas grill for the full outdoor experience. There is also a fire pit in front of the home, perfect for a campfire and some s'mores. If you are looking for activities, rent or bring a bike and bike the many trails in the area that lead from Little Traverse Lake all the way to Sleeping Bear Dunes and beyond. Relax and leave your worries behind. Come enjoy the splendor of a fantastic Northern Michigan experience without having to pack the kitchen sink. Our cottage comes fully equipped from the kitchen utensils to bed linens. Traverse Lake is located in Leelanau County between Leland and Glen Arbor. The Lake is within the Sleeping Bear National Lakeshore and close to several of Northwest Michigan's many attractions. It is adjacent to the National Lakeshore property which offers miles of heavily forested trails, as well as beautiful, Lake Michigan shoreline to take walks or hunt for Petoskey stones. There is also a bike trail that travels from Little Traverse Lake all the way to the Sleeping Bear Dunes. This cottage is built very close to the lake. If you want to get any closer to the water, you have to jump in! 'One of the best spots on Little Traverse Lake. The NW facing view allows for colorful sunsets after a day of water sports and sight seeing'. Brand new dishwasher installed this year. There is a limited selection of board games, cards and puzzles for our guests to use. There is a large lawn behind the house. There are 2 kayaks for renters use, along with many life jackets in all sizes. Very beautiful house by the lake. Excellent hospitality. I went to this cottage with my parents and a couple of friends for the weekend. The house was very big and really beautiful! We thoroughly enjoyed the stay. The firepit right by the lake was really amazing! We spent most of our time there. The view of the lake is really beautiful. We would like to come back again some time soon! This was definitely one of the best cottahes I’ve taken! The house has literally everything you need. We found the Lake House to be just the place for a family vacation with all our adult children and 16 month old granddaughter. The cottage is set back from the road as described so quieter. The house has the classic Up North feel but with nice upgrades for the kitchen, open areas, bathrooms. The large picture windows gave great views of the lake, the deck was wonderful place to have meals, the dock was perfect for sunning and for catching the last rays of the sunset! We enjoyed having time to talk and play games while we sat around the fire pit and the sandy beach area was a nice transition to the shallow wading area & out to swim. The kayaks were put to good use several days of our stay. It is a good location for trips into Glen Arbor and Sleeping Bear area hikes. Also easy access to Fishtown and across to Suttons Bay area. We used Market 22 across the street for supplies and great pizza! Good Harbor Bay Beach was close by for quick Lake Michigan beach time! We had a wonderful time and would love to come back for another stay! Recommend highly. Owners prompt in response to any questions. Our family enjoyed our vacation at the cottage. Our grandchildren had a great time using the kayaks. We enjoyed the warm shallow water and beach area and sitting out on the dock watching the sunset. We had a fire every night and enjoyed the sandy area around the fire pit. The cottage was very roomy for 8 people and was nicely finished throughout.However the tiling around the main bathroom could use a renovation. All in all, it’s was great time. Little Traverse Lake is beautiful and the house was perfect. Great place to stay. My family had a FABULOUS week staying in this house on Little Traverse Lake. Although we have stayed in more modern places, this house was quaint and the outside space was so great. We had fires every night, sunbathed on the dock daily, went kayaking, grilled, and even managed to catch a few fish. The broom, dishwasher, and washer/dryer were lifesavers. I would highly recommend this house for a nice, relaxing getaway and would definitely stay here again. The owners were more than gracious and easy to work with. I'm just sorry the time went by so fast. This was wonderful!!! We stayed with our 7 month old son - enjoyed the fire and grill! Would love to come back here. Very comfortable and clean inside. Thanks for making this such a great place to stay for our first vacation as a family of 3! Beautiful sunsets and stars! Great swimming in sandy lake, shallow, warm, and no drop off, this is perfect for families with small kids, & fishing onsite, Numerous golf courses, wineries, breweries, shopping & dining options, charter fishing, Day trips to Sleeping Bear Dunes National Park, Manitou Islands, many quaint historical lakeside villages, wine tasting, canoeing & river tubing, and biking trails. This cottage is centrally located to all of the family fun that the Leelanau Peninsula has to offer.